What does optimized for mobile mean in SEO? If your site is optimized for mobile, this means that it will reformat itself for a list of handheld or tablet devices, or that a specific mobile site will appear for visitors using a mobile device. Reformatting implies larger buttons, elimination of pop-ups that are aimed for larger desktop screens, reformatted image dimensions, and removal of elements that will take too long to load or use up an excess of bandwidth, since visitors can be on a 3G connection. Being optimized for mobile is important for SEO because search engines care about a good user experience where the visitor finds what they are looking for and can easily navigate your site. As of 2018, 52.2% of all website traffic worldwide was generated through mobile phones, so that’s another reason why every site should be aiming to attract and keep mobile visitors. 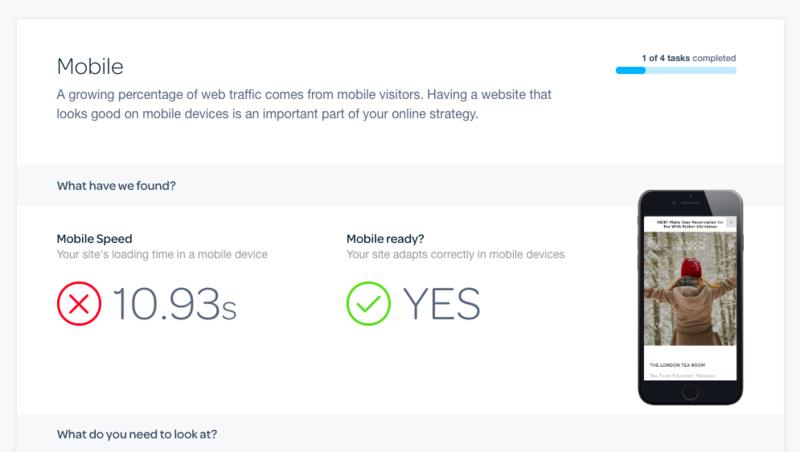 MarketGoo evaluates how well your website functions on smartphones and tablets, then provides advice to ensure your website is speedy and easy to use on mobile. In this area we will focus on actions that improve your site’s mobile performance. This is especially important because most mobile visitors expect a responsive, customised site and a faster experience than a regular site. It is likely that a significant percentage of the traffic to your site come from mobile devices, so it is critical in order to engage these visitors. Pay special attention to how your site looks in different mobile devices; if you were a visitor, would it seem appealing and easy to use? Whether you have never optimised your site for mobile devices, or you already have a responsive or dedicated design, using MarketGoo you will learn why this is critical for your website’s success and how it fits into your overall web optimisation strategy. We will guide you through eliminating unnecessary design elements and offering your potential visitors the information they are looking for as quickly and easily as possible.